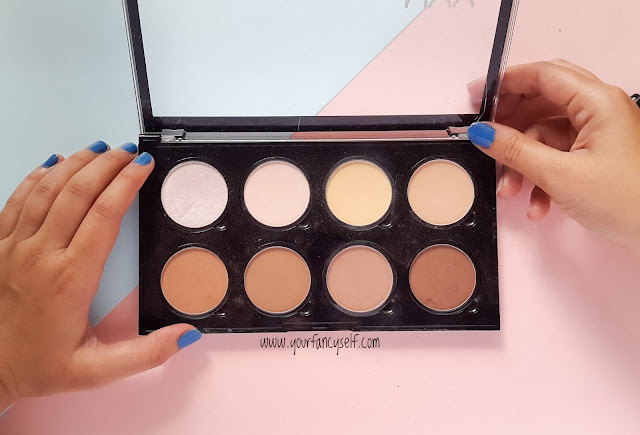 NYX Pro Makeup Highlight & Contour Pro Palette| Review & Swatches - YOUR FANCY SELF! 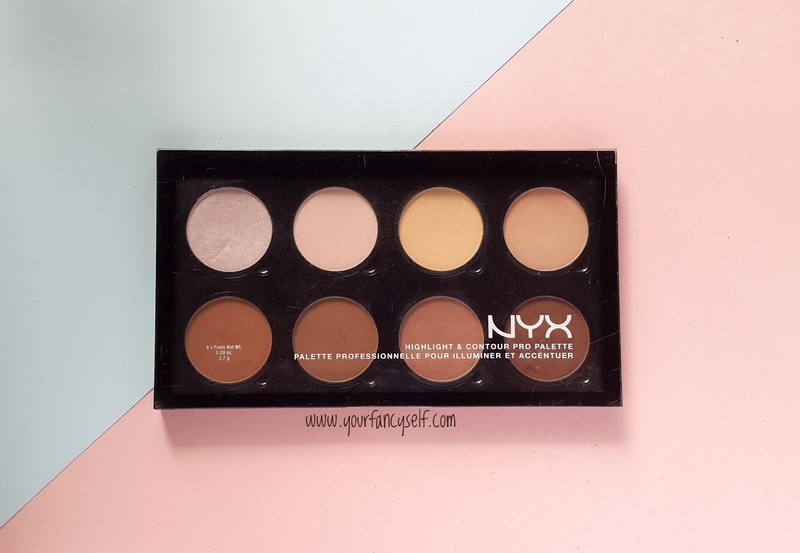 Today's Blogpost is about this contour and highlighter palette by NYX cosmetics. This palette has been around for quite some time, however NYX was launched in India in 2016. So lets get into the entire review. Starting with the packaging it is a pretty sturdy one with a transparent lid. However, I wish it had a mirror too. And great thing about this palette is that all the 8 pans pop out, which is ideal if you hit pan on even just one shade, you don't need to buy the entire palette. But in my opinion, the pans are not available in india separately. It is pretty good size palette which means more product. You get a total of 8 pans in this palette, which include 4 highlight shades and 4 contour shades. Talking about the consistency of the product, all the shades are pretty smooth and finely milled powder. Though 1 highlighter shade has a more satin-creamy finish. All the shades blend easily and they aren't chalky. So out of 4 contour shades, 2 of them are bronzy and are great bronzers. One of the bronzer called tan is warmer while the other called Toffee is a little cool-toned one. 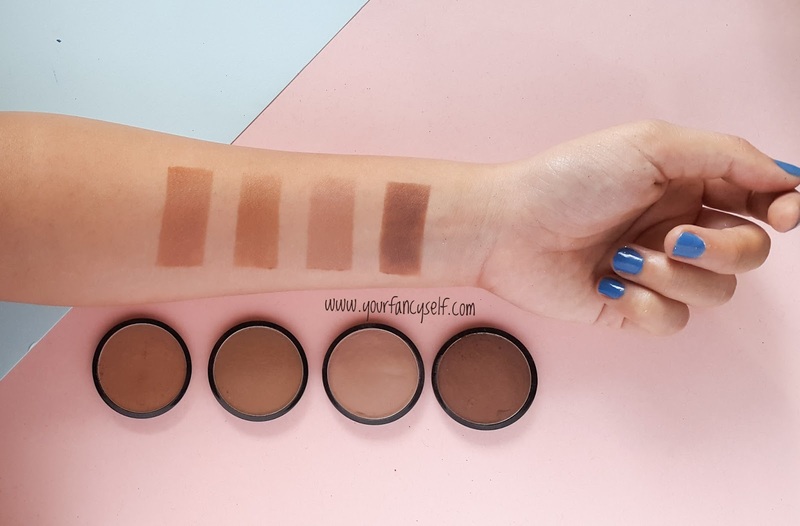 The other 2 shades are great for contouring, one of them is lighter and ashy called Sculpt while other darker one is called Hollow and it great for people with dark skin tones. Sculpt is great contour shade for people with light to medium skin tones. I myself use this shade the most for contouring and love it. I also use Tan to warm up my skin a little bit. I also use Tan and Sculpt as crease shades for my eye-makeup too. 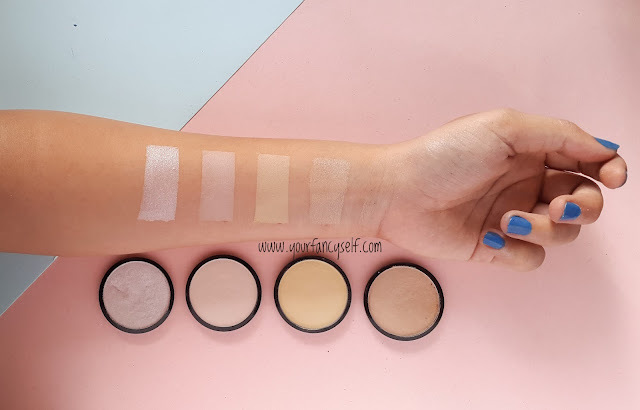 Out of 4 highlighter shades, there are 2 completely matte powder shades named Soft light and Cream, which can be great for setting and highlighting under the eyes. I love this yellow color called cream and it is like a banana powder. This shade instantly brightens up under the eyes and balances out the concealer. I have used Cream the most in this palette. The soft light shade is a white matte highlighter which would only suit people with light or medium skin. The other two highlighter shades have sheen to them. The lighter peachy-golden shade called Nectar is however not every shimmery or shiny, so it can be dusted on the entire face for a healthy glow. The most intense and shimmery highlighter shade is this palette is Ice Queen. It is a very cool-toned pinky-slivery highlighter. 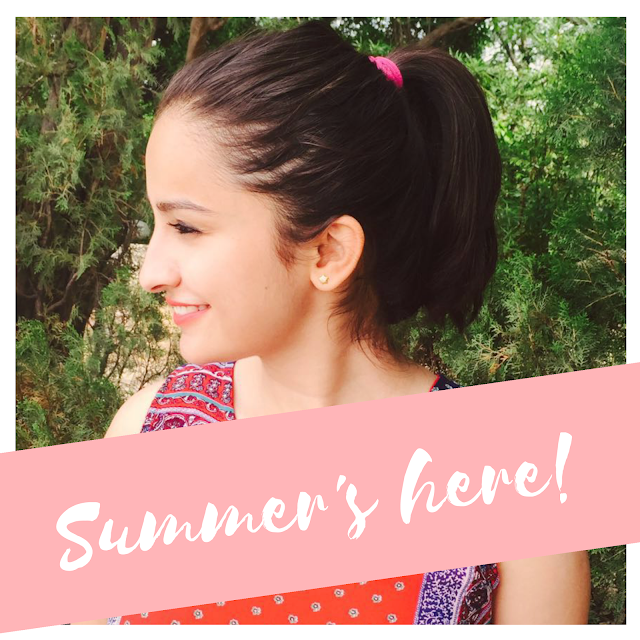 I personally don't like this much as this doesnot suit much on my warm skin and it won't suit most of the indian skin tones. However, you can make this shade work by mixing it with some golden highlighter. Texture-wise it is good, but sometimes if not blended well it will enchance your skin's texture. 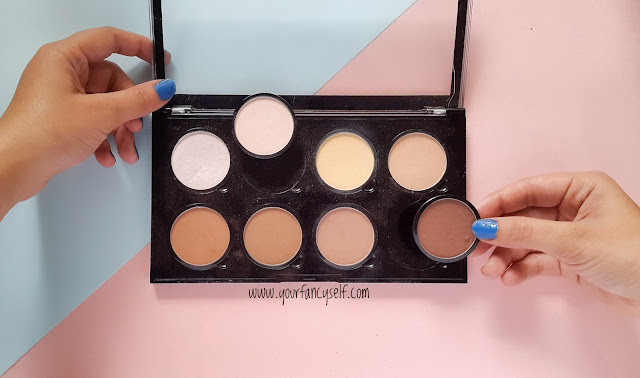 Overall, it is a great palette for contouring, bronzing and highlighting. This palette alone is good for all and is great when you are travelling, for you will have all the products in one place. However, you might need a different shimmery highlighter. Awesome review... Great clicks... I love these pics and I'm definitely going to take inspiration from them..